Original content posted August 2016. Updated April 2019. 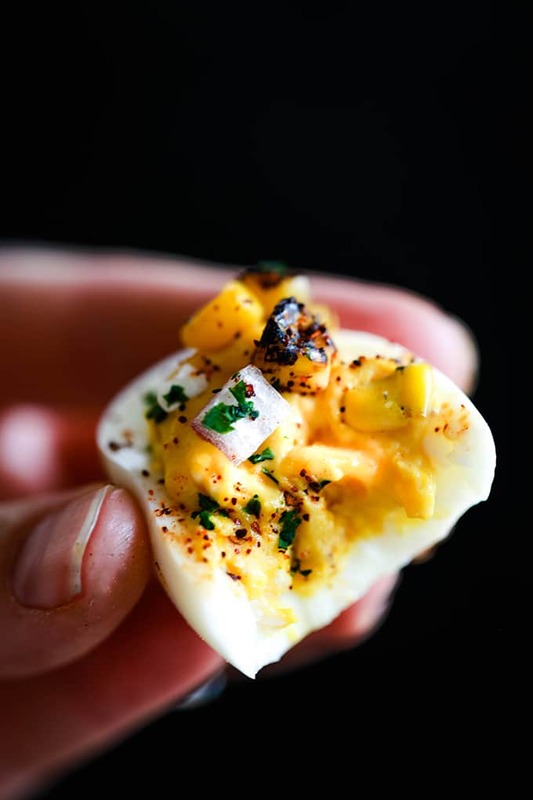 Raise your hand if you love deviled eggs! I’ve shared my Shrimp and Bacon Stuffed Deviled Eggs and Dyed Deviled Eggs, but these Mexican Street Corn Deviled Eggs have it all. This is it. Your excuse to head to your local farmer’s market and get all the good stuff. All the produce that’s at the peak of deliciousness. While you’re there, grab some eggs and cheese and you’ll be well on your way to this amazing side dish. So much deliciousness in one single bite. You won’t wonder for long as to how they disappear so quickly! Mexican street corn, you say? If you’ve never tried it, it’s absolutely amazing and such a great way to enjoy an ear of corn in the summer. Grilled ears of sweet corn are slathered with spiced mayonnaise and then rolled in cheese. I mean, I’m sure I could eat my weight in that corn. A traditional deviled egg filling of yolk, mayonnaise and mustard is mixed with feta cheese before filling each egg white half. 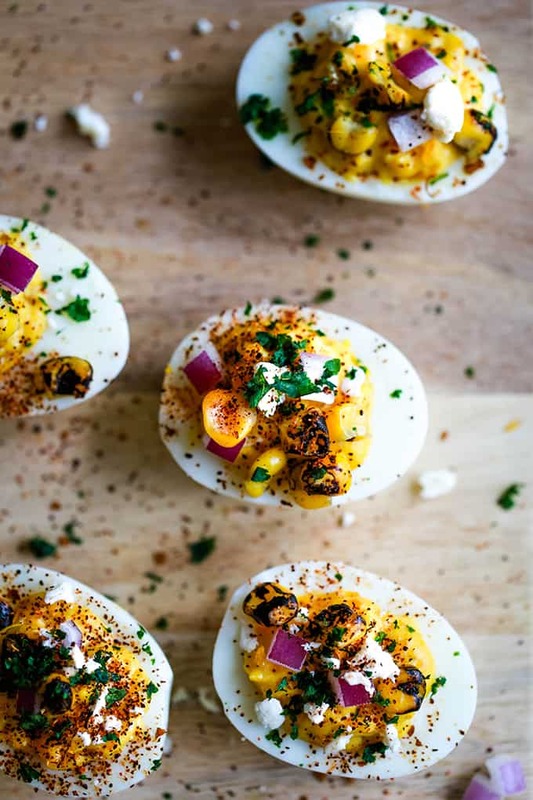 Each egg is then garnished with red onion, grilled corn, chili powder and cilantro to create these can’t stop at just one Mexican Street Corn Deviled Eggs. 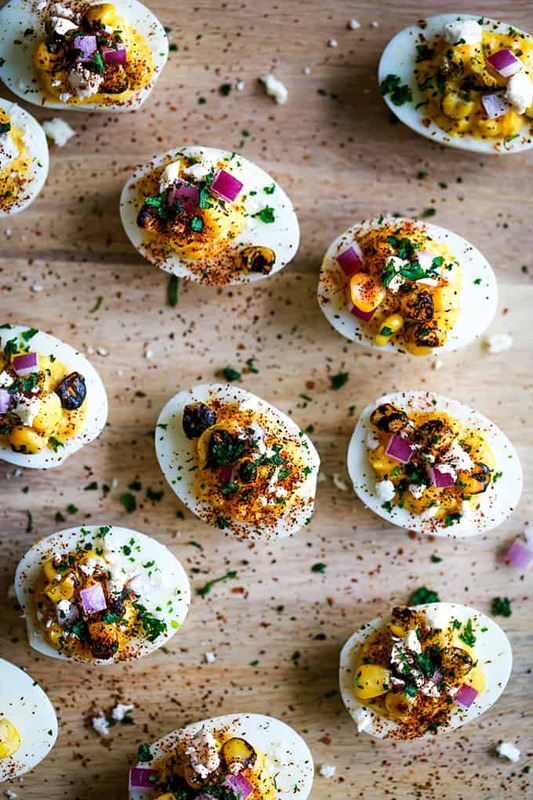 Now it’s your turn to make these Mexican Street Corn Deviled Eggs and all of the toppings that bedazzle their tops! They’re the perfect make ahead side dish for all get togethers, barbecues and pretty much any other day you’d like to enjoy them. In a large pot, add eggs. Cover with water so that water line is 2″ above eggs. Bring to a boil over high heat. When water reaches a boil, cover pot and remove from heat. Allow to sit for 10 minutes. Place pot in sink and add cold water until water in pot is completely cool to stop cooking process. Slice in half lengthwise and remove yolks to medium bowl. With a fork, mash yolks until smooth. Add mayonnaise, mustard, Worcestershire sauce, Tabasco sauce and 1/4 cup cheese to bowl. Stir together until smooth and well combined. Add yolk mixture to food storage bag and seal. Snip off one corner of bag to act as piping bag and fill the cavity of each egg white with yolk mixture. TIP: I don’t often have food storage bags on hand as I use reusable silicone bags in the kitchen. I do, however, often have frosting piping bags which I love to use for this recipe. Just be sure to cut the opening wide enough to allow the feta cheese to pipe easily without getting stuck! Garnish each egg with red onion, corn, chili powder and cilantro. TIP: Don’t want to mess with grilling an ear of corn for this recipe? No problem! You can also substitute frozen fire roasted corn and simply thaw before using. 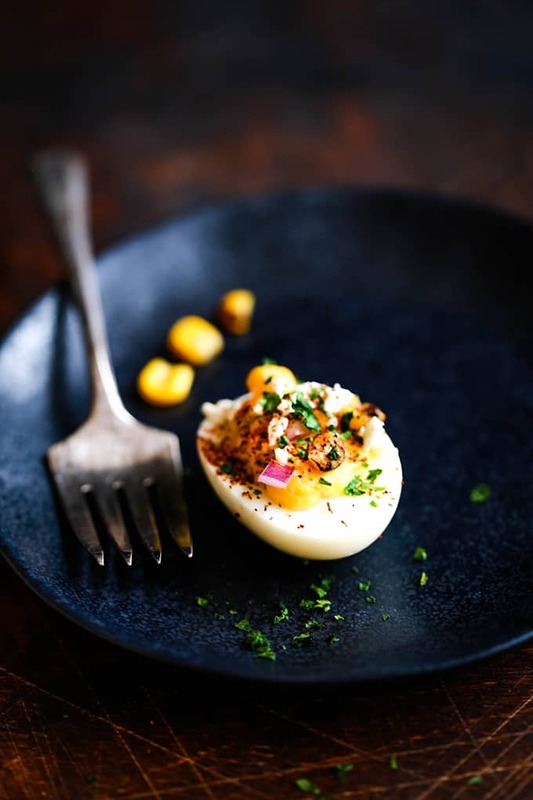 If you’ve tried these Mexican Street Corn Deviled Eggs or any other recipe on Melanie Makes, please let me know your thoughts in the comments below. I love hearing from you and respond to each and every comment! 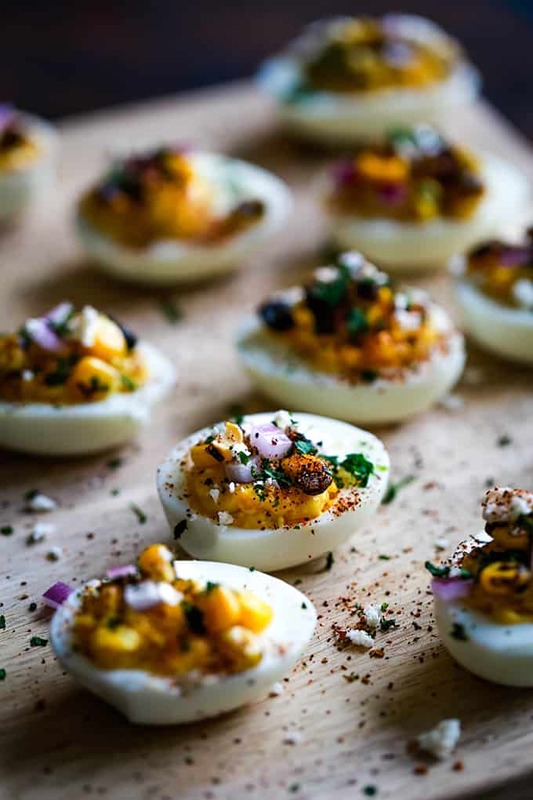 These Mexican Street Corn Deviled Eggs are guaranteed to be the talk of your next gathering! 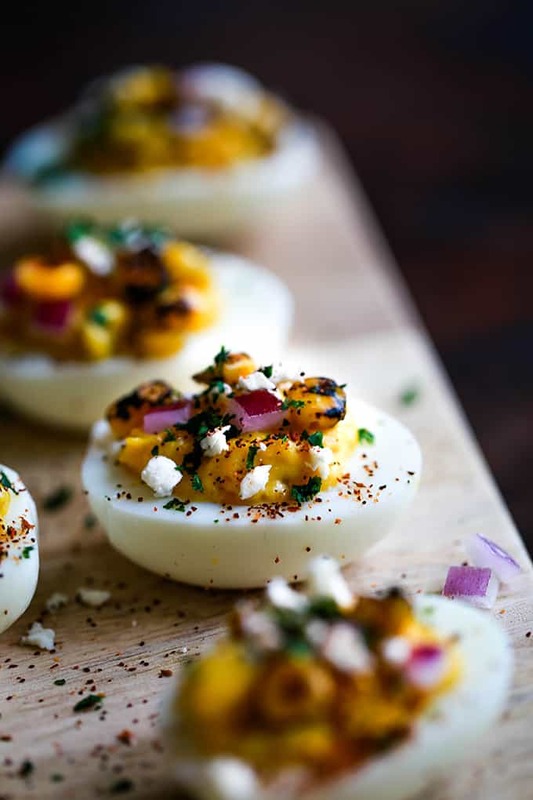 Traditional deviled eggs are garnished with feta cheese, grilled corn, red onion, chili powder and cilantro to create one amazing bite size appetizer. 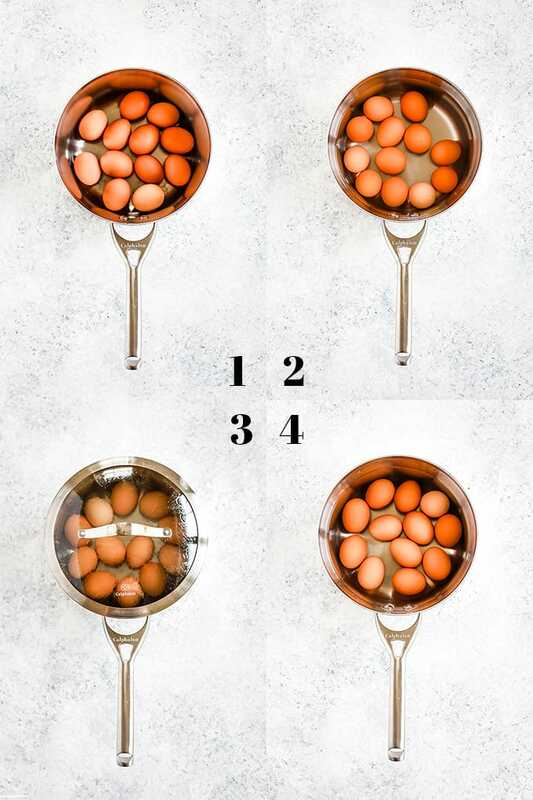 In a large pot, add eggs and cover with water 2" above eggs. Bring to a boil over high heat. When water reaches a boil, cover pot and remove from heat. Allow to sit for 10 minutes. 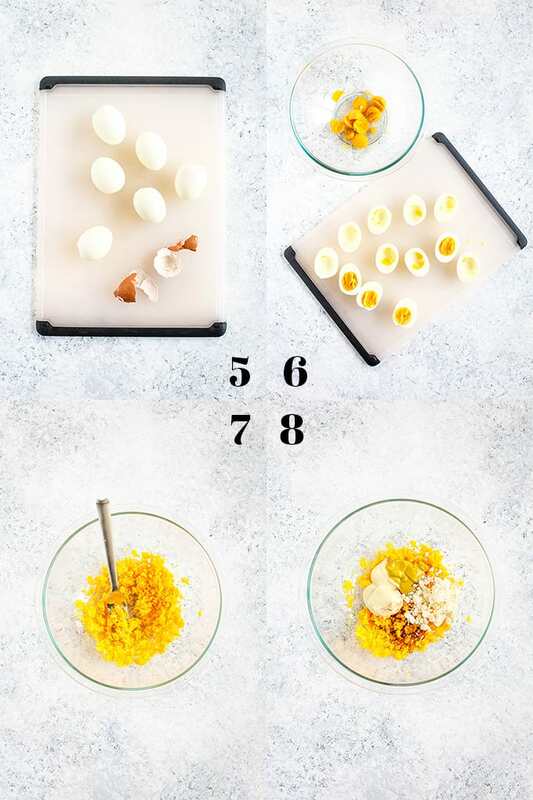 Peel each egg and slice in half lengthwise and remove yolks to medium bowl. With a fork, mash yolks until smooth. Add mayonnaise, mustard, Worcestershire sauce, Tabasco sauce and 1/4 cup cheese. Stir together until smooth and well combined. Add salt and pepper to taste. Looking for other ways to get your Mexican street corn fix? You might also like this Mexican Street Corn Salad, Skillet Mexican Street Corn with Squash and Kielbasa and this Mexican Street Corn Salsa Hummus. I must admit that they are super addictive, Erin! 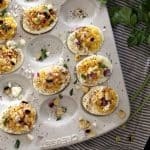 Absolutely love this version of deviled eggs! So much flavor! They definitely do at our house! Eggs with a kick hell yeah!! I was actually looking for a recipe like this. I will try it for Easter! Can't wait to hear what you think, Catalina! humm… thats look so delicious.. i wana a try it.. I like your ideas. I like all the additional flavors you put into the yolk. I am going to make these beautiful babies with your recipe and see how they are received. What a great twist on such a classic! Can't wait to make! I have always wanted to try these. They look so amazing !! Thanks, Amanda - hope you will! My two most guilty pleasure foods, in one! When I was looking online for twists on deviled eggs, the sky parted & angels came down singing mariachi tunes. You're recipe sounds DELICIOUS! When I make it, I'll definitely use cotija cheese, eliminate the onion, cilantro, & Tabasco.... go heavy on the mayo, add lime juice to the mix , and ancho chile powder, too. Also as garnish. OR substitute the lime juice & ancho for Tajin powder or something like if (all around!). With those tweaks, it would create the mexican street corn flavor profile that I loved eating as a kid growing up in Mexico City... and my grandma's super WASPy deviled eggs she'd make for me while visiting her in Alderbrook, Hood Canal, Washington. Kudos to you for conjuring & mixing the spirit of culturally favorite snacks. I'm very excited to make them! Thanks so much - can't wait to hear what you think! Oh my goodness...I need these in my life. These are perfect for my vegetarian daughter, too. We were just talking about Mexican vegetarian recipes last night. Thank you so much, Missy! I hope you both love them! LUV me some deviled eggs and corn but it never occured to me to mix them up!! Like Leia I cannot find the widget for the give away even after reloading the page several times. These are so unique - love the twist on the classic! I think this sound so good. I would love to try it. I have not had mexican street corn. I think you'd love these, Linda! 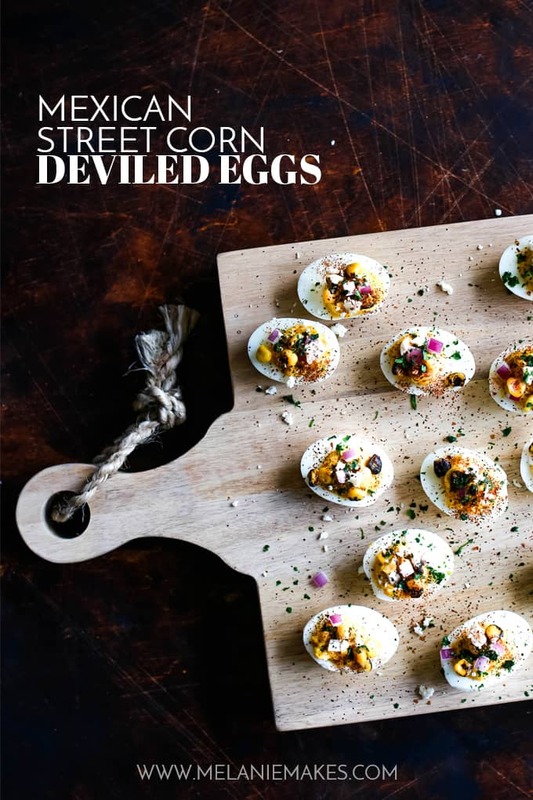 I love Mexican Street Corn, so I definitely have to try these eggs --- Yum! I think you'd love these then, Dee! Deviled eggs just got a whole lot butter! Love this idea! 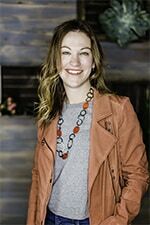 Thanks, Erin - so appreciate your kind words! What a fun idea to combine two delicious dishes in one. I can't wait to give these a try. These deviled eggs are delicious looking! Love that Mexican street corn twist! These sound super, I love a good deviled egg! Oh my goodness! 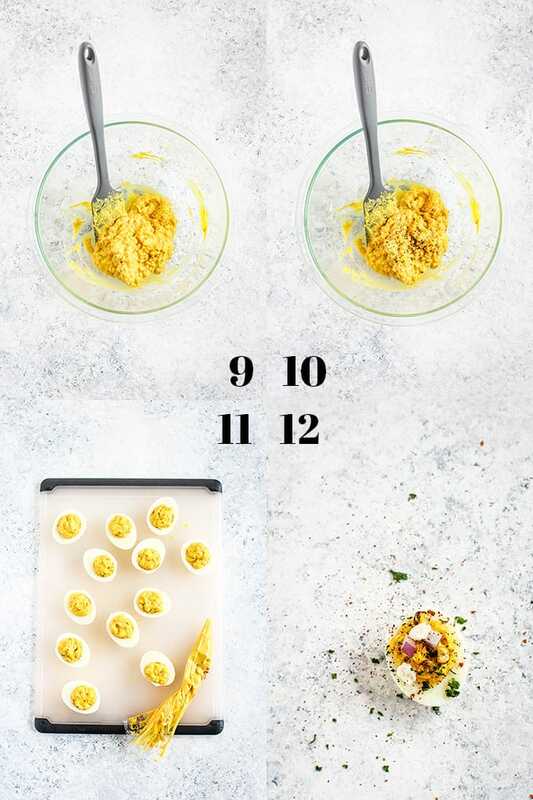 What a great idea for deviled eggs! Can't wait to try them! Those eggs look delicious!! I would enter the giveaway but the widget never did load.